CLICK HERE TO DOWNLOAD YOUR FREE #My200BIRDYEAR LIST! As well as keeping track of the species that you’ve seen as you go along, our Target List can help you to find more birds each time you go out. So, for example, if Dominic Couzens’ feature on Wood Larks in the December 2016 issue of Bird Watching has inspired you to go out and look for these understatedly beautiful songsters, look down the list for other species that share the same broad habitat preferences, and can be found at the same time of year, and brush up on their ID characteristics too before you set out. That way, there’s far more chance of one of those ‘happy accidents’ that make birding so endlessly enthralling and rewarding happening – you might miss out on the Wood Larks this time, but in the process pick up other new, and equally memorable species, such as Nightjar or Dartford Warbler. But just as with field guides, the list comes with a friendly warning – don’t treat it as though it were carved in stone. Most bird species can sometimes crop up out of place and time, especially during the spring and autumn migration periods, and/or just after periods of bad weather. Also, all field guides are inevitably a little out of date, and it can be that a species has expanded its population and range in the time since the book was published. So, if you are heading off in search of a particular species, bear these 5 key pointers in mind. 1. Check the #My200BirdYear website. We’ll be posting twice-weekly ‘What’s About?’ updates, highlighting trends in bird movements (for example, Waxwing invasions), large gatherings (such as Starling murmurations), and major rarities. 2. If there’s a website or Facebook page covering the location in question, check it to see if recent sightings have been posted. Many bird clubs and reserves also post sightings on Twitter. 3. Once you’re at the site, ask staff or fellow birders what’s been seen, or check the sightings board. 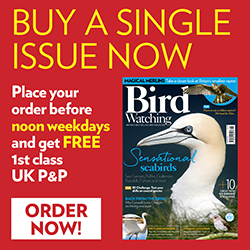 There’s no shame in getting a helping hand to begin with, and you’ll soon be finding plenty of your own birds and pointing them out to other birdwatchers. 4. Don’t be afraid to suggest an ID of an unknown bird out loud – we all learn by making mistakes, and other birders won’t be upset if you initially call a Pectoral Sandpiper, for example, they’ll just be glad you pointed out the rare wader that they’d missed. 5. If you do see something you just can’t ID at the time, get a photo of it if at all possible. Even a long-distance snap on a phone camera can sometimes be enough to clinch an awkward identification later, once you’ve had chance to consult field guides and other resources. Sign up to the #My200BirdYear challenge and get first alerts on: how to spot more birds, top tips to improve your birding, exclusive guides from birding experts and much more!